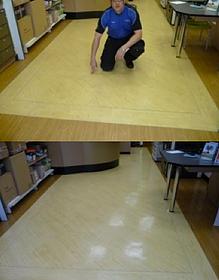 Do you want your vinyl floor to last longer and look cleaner all the time? Your floor will be inspected for any damages or cleaning challenges – BE AWARE – some deep scratch marks cannot be removed. We cannot guarantee 100% spot removal and scratches removal. Sweeping the floor well to remove dry soil that can cause further wear to the floor during the cleaning process is removed. The cleaners are applied to the floor and then scrubbed by means of electrical scrubbers with soft brushes or pads depending on your floors requirements. A special pad is used as the last step to prepare the surface for the application of the sealer. Sometimes the cleaning process is repeated if the desired results are not achieved the first time round. This steps is crucial for ensuring your floor last as long as possible. The sealer acts as a barrier to soiling and scuffing to the floor itself. Depending on how many coats are applied – it will deliver a sheen on the floor. – No traffic is allowed on the floor for 2 – 4 hours following the application of dressing – PLEASE NOTE – areas with low airflow and higher humidity can take considerably longer to cure and we advise clients to use common sense before returning the area to full use. We strongly advise the use of a special cleaning product to maintain the floor. A good quality felt pad will not just protect your floor from wearing out fast but will also protect your furniture from unnecessary stress when dragged. Your floor will be inspected for any damages or cleaning challenges – BE AWARE – some deep scratch marks cannot be removed. The Amtico Cleaners are applied to the floor and then scrubbed by means of electrical scrubbers with soft brushes or pads depending on your floors requirements. A special pad is used as the last step to prepare the surface for the application of Amtico dressing. The floor is then rinsed to remove the dirt (Slurry). Sometimes the cleaning process is repeated if the desired results are not achieved the first time round. PLEASE NOTE – areas with low airflow and higher humidity can take considerably longer to cure and we advise clients to use common sense before returning the area to full use. We strongly advise the use of a Amtico Maintenance Kit – This will be as specified on your quotation. Felt pads for furniture – Furniture can easily scratch and wear out your floors and therefore we advise the use of good quality felt pads We can provide you with a high quality felt pad system A good quality felt pad will not just protect your floor from wearing out fast but will also protect your furniture from unnecessary stress when dragged. The Vinyl Maintenance Plan is an on-going maintenance plan designed to keep your floors healthy and looking good all year long, year after year. You will actually save more money than you realise because you can expect your flooring to last two to three times longer before you need to replace them. – Then one Full cleaning and seal Treatment in 12 months. We’ll call you and arrange a convenient time to re-clean and re-protect all items in the programme. – And of course, if you can’t take care of the spot or spill yourself then all you need to do is call us for: One Free Emergency Spot Removal Visit per year. We will come out to you as soon as we can, and do our best to remove it for you. Emergency spot removal visit is free whilst you are a member of the Maintenance Plan.